You can select and tote your own selections from the buffet setup. Or, you can simply stay put at your table or pool-side lounge chair and instruct your waiter what you would like him to bring you. 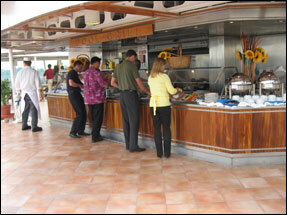 For non-pool cruise passengers, there are ample sea-view deck tables a distance from the pool. Hamburgers, fries and grilled skewered meats are guest favorites. You also have a wide choice of sandwiches, salads, fresh fruits and other casual fare. Beverages include wine, beer, iced tea, soft drinks and bottled water. It is hard to resist the tempting assortment of canapes, finger sandwiches, and High Tea cakes and pastries served in the lounges. 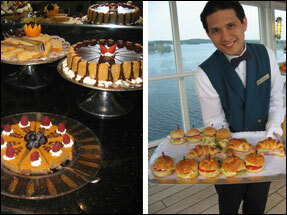 If your suite comes with a butler, he will spoil you with a late-afternoon plate of canapes and other tidbits. to vist the cruise line's website.